Reading and share top 119 famous quotes and sayings about Coins by famous authors and people. Browse top 119 famous quotes and sayings about Coins by most favorite authors. 1. "What we have forgotten is that thoughts and words are conventions, and that it is fatal to take conventions too seriously. A convention is a social convenience, as, for example, money ... but it is absurd to take money too seriously, to confuse it with real wealth ... In somewhat the same way, thoughts, ideas and words are "coins" for real things." 2. "This household is like a pocketful of coins that jingled together for a time, but now have been slapped on a counter to pay a price. The pocket empties out, the coins venture back into the infinite circulation of currency, separate, invisible, and untraceable." 3. "…praise any word that can hold you. Praise all but the vanishing point where we stand now, not quite parted. Already memories fall like blows. 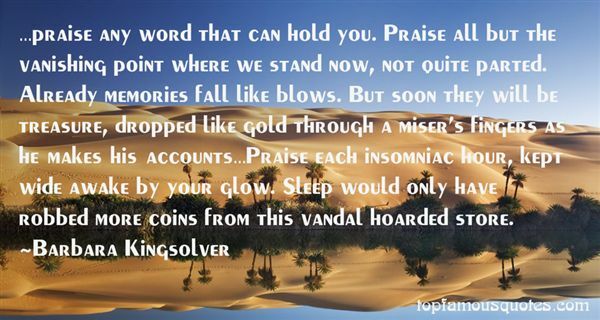 But soon they will be treasure, dropped like gold through a miser's fingers as he makes his accounts…Praise each insomniac hour, kept wide awake by your glow. Sleep would only have robbed more coins from this vandal hoarded store." 4. "I don't sell spells, and I don't sell tricks. I don't carry illusions or marked cards or weighted coins. I cannot sell you an endless purse or help you win the lottery. I can't make that girl you've got your eye on fall in love with you, and I wouldn't do it even if I could. I don't have a psychic hotline to your dead relatives, I don't know if you're going to be successful in your career, and I don't know when you're going to get married. I can't get you into Hogwarts or any other kind of magic school, and if you even mention those stupid sparkly vampires I will do something unpleasant to you." 5. "What a pair they were - a Mistborn who felt guilty wasting coins to jump and a nobleman who thought balls were too expensive." 6. "The seals stupidly dive off rocks into swirling black water, barking mindlessly. The zookeepers feed them dead fish. A crowd gathers around the tank, mostly adults, a few accompanied by children. On the seals' tank a plaque warns: COINS CAN KILL——IF SWALLOWED, COINS CAN LODGE IN AN ANIMAL'S STOMACH AND CAUSE ULCERS, INFECTIONS AND DEATH. DO NOT THROW COINS IN THE POOL. So what do I do? Toss a handful of change into the tank when none of the zookeepers are watching. It's not the seals I hate——it's the audience's enjoyment of them that bothers me." 7. "So what do you do?' she asked. 'I sneak around at night, well, usually at night, and gather coins out of fountains', I said slowly, watching her face for judgement. She burst into laughter. 'Like spare change? You collect people's wishes? And you spend them on yourself?' 'They're not wishes' I said. 'They lose their symbolism once they hit corporate water. At that time they either become extra income for people who don't need it, or they can help me get along in the world." 8. "The Stars. Jared slept beneath them, uneasy in the rustling leaves. From the battlements Finn gazed up at them, seeing the impossible distances between galaxies and nebulae, and thinking they were not as wide as the distances between people. In the study Claudia sensed them, in the sparks and crackles on the screen. In the prison, Attia dreamt of them, She sat curled on the hard chair, Rix repacking his hidden pockets obsessively with coins and glass discs and hidden handkerchiefs. A single spark flickered deep in the coin Keiro spun and caught, spun and caught." 9. "Ostriches like shiny things like coins and eyeballs." 10. "A plate of roast duck, steamed dumplings, spicy noodles with beef gravy, pickled cucumbers, stewed tongue and eggs if you have them, cold please, and sticky rice pearls, too,' Ai Ling said, before the server girl could open her mouth. "I don't know what he wants." Ai Ling nodded toward Chen Yong. 'I'm not sure I have enough coins to order anything more,' he said, laughing." 11. "When, as my friend suggested, I stand before Zeus (whether I die naturally, or under sentence of History)I will repeat all this that I have written as my defense.Many people spend their entire lives collecting stamps or old coins, or growing tulips. I am sure that Zius will be merciful toward people who have given themselves entirely to these hobbies, even though they are only amusing and pointless diversions. I shall say to him : "It is not my fault that you made me a poet, and that you gave me the gift of seeing simultaneously what was happening in Omaha and Prague, in the Baltic states and on the shores of the Arctic Ocean.I felt that if I did not use that gift my poetry would be tasteless to me and fame detestable. Forgive me." And perhaps Zeus, who does not call stamp-collectors and tulip-growers silly, will forgive." 12. "Say a king wishes to support a standing army of fifty thousand men. Under ancient or medieval conditions, feeding such a force was an enormous problem—unless they were on the march, one would need to employ almost as many men and ani­mals just to locate, acquire, and transport the necessary provisions. On the other hand, if one simply hands out coins to the soldiers and then demands that every family in the kingdom was obliged to pay one of those coins back to you, one would, in one blow, turn one's entire national economy into a vast machine for the provisioning of soldiers, since now every family, in order to get their hands on the coins, must find some way to contribute to the general effort to provide soldiers with things they want. Markets are brought into existence as a side effect." 13. "Usu­al­ly, very ear­ly in the morn­ing. Ger­man la­bor­ers were go­ing to work. They would stop and look at us with­out sur­prise. One day when we had come to a stop, a work­er took a piece of bread out of his bag and threw it in­to a wag­on. There was a stam­pede. Dozens of starv­ing men fought des­per­ate­ly over a few crumbs. The work­er watched the spec­ta­cle with great interest. Years later, I witnessed a sim­ilar spec­ta­cle in Aden. Our ship's pas­sen­gers amused them­selves by throw­ing coins to the "natives," who dove to retrieve them. An el­egant Parisian la­dy took great plea­sure in this game. When I no­ticed two chil­dren des­perate­ly fighting in the wa­ter, one try­ing to stran­gle the oth­er, I implored the la­dy: "Please, don't throw any more coins!" "Why not?" said she. "I like to give char­ity…"
14. "The brain of the modern human is no longer capable of understanding reality directly. It used to be that a person lived, looked toward the horizon, howled at the moon, and formed his conceptions, however biased, based on his own experiences and observations. There used to be this thing called independent learning. Not anymore. They crystallize our brains like ice from water. Imagine how slowly, starting in childhood, your brain is crystallized for you, forming your conception of reality. We could even determine a unit of currency for all humanity, ‘the value of one concept.' Everyone would have their own change purse, so to speak, and the coins in it, though of various values, quantities, styles, and metals, would all be from a single mint." 15. "They again kissed each other and fell asleep. The patch of light on the ceiling now seemed to be assuming the shape of a terrified eye, that stared wildly and fixedly upon the pale, slumbering couple who reeked with crime beneath their very sheets, and dreamt they could see a rain of blood falling in big drops, which turned into golden coins as they plashed upon the floor." 16. "His lordship and I are...opposite sides of very different coins." 17. "A girl came in the cafe and sat by herself at a table near the window. She was very pretty with a face fresh as a newly minted coin if they minted coins in smooth flesh with rain-freshened skin, and her hair black as a crow's wing and cut sharply and diagonally across her cheek." 18. 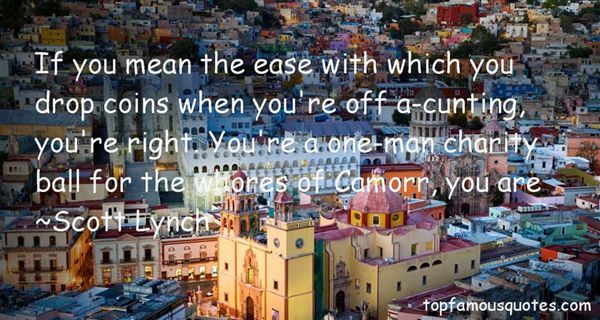 "The urge to travel feels magnetic. Two of my favorite words are linked: departure time. And travel whets the emotions, turns upside down the memory bank, and the golden coins scatter." 19. "What therefore is truth? A mobile army of metaphors, metonymies, anthropomorphisms: in short a sum of human relations which became poetically and rhetorically intensified, metamorphosed, adorned, and after long usage seem to a notion fixed, canonic, and binding; truths are illusions of which one has forgotten that they are illusions; worn-out metaphors which have become powerless to affect the senses; coins which have their obverse effaced and now are no longer of account as coins but merely as metal." 20. "You, my child, will marry well. More than once." (...) The lady retrieved the cards and shuffled them back together into one stack in an attitude of dismissal.Taking this as a sign her fortune was complete, Preshea stood. Looking particularly pleased with life, she passed over a few coins and gave Madame Spetuna a nice curtsy.Mademoiselle Geraldine was fanning herself. "Oh, dear, oh, dear, Miss Buss. Let us hope it is widowhood and not" - she whispered the next word - "divorce that leads to your multiple marriages. "Preshea sat and sipped from a china cup. "I shouldn't worry, Headmistress. I am tolerably certain it will be widowhood." 21. "Free folk don't follow names, or little cloth animals sewn on a tunic," the King-Beyond-the-Wall had told him. "They won't dance for coins, they don't care how your style yourself or what that chain of office means or who your grandsire was. They follow strength. They follow the man." 22. "Je ne suis pas plus moderne qu'ancien, pas plus Français que Chinois, et l'idée de la patrie c'est-à-dire l'obligation où l'on est de vivre sur un coin de terre marqué en rouge ou en bleu sur la carte et de détester les autres coins en vert ou en noir m'a paru toujours étroite, bornée et d'une stupidité féroce." 23. "It is very evident what mean and sneaking lives many of you live, for my sight has been whetted by experience; always on the limits, trying to get into business and trying to get out of debt, a very ancient slough, called by the Latins aes alienum, another's brass, for some of their coins were made of brass; still living, and dying, and buried by this other's brass; always promising to pay, promising to pay, to-morrow, and dying to-day, insolvent..."
24. "Torch strode over and stared at the fiver"What's this? ""Some change for you. Buy your flunkies some decent clothes." I dipped my fingers into the jar and smeared think fragrant paste on my face. Torch frowned, mirroring the expression on my aunt's face."Change? "Oh, for crying out loud. "It's money. We don't use coins as currency now, we use paper money." He stared at me. "I'm insulting you! I'm saying your poor, like a beggar, because your undead are in rags. I'm offering to clothe your servants for you, because you can't provide for them. Come on, how thick do you have to be? "He jerked his hand up. A jet of flame erupted from his fingers, sliding against the ward. I jerked back from the windows on instinct. The fire died. I leaned forward. "Do you understand now?" More fire. "What's the matter? Was that not enough money?" 25. "I had, of course, witnessed hundreds of people in a casino before, mindlessly dropping coins into slot machines. They don't play for money in America. It's true. The big payout is incidental to most gamblers. It's the numbness they're after. Not so in China. No one had that look of glazed stupor often found in American casinos." 26. "Young adults in China who have spent so much play money, or "QQ coins," on magical swords and other powerful game objects that the People's Bank of China intervened to prevent the devaluation of the yuan, China's real-world currency.2"
27. "Owen meany who rarely wasted words and who had the conversation-stopping habit of dropping remarks like coins into a deep pool of water... remarks that sank, like truth, to the bottom of the pool where they would remain untouchable." 28. "The ship started a school of fliers that skipped along the wave tops like shining silver coins. "These are the ghosts of treasures ost at sea," the cook went on, "the murder things, emeralds and diamonds and gold; the sins of men, committed for them, stick to them and make them haunt the ocean. Ah! It's a poor thing if a sailor will not make a grand tale about it. "Henry pointed to a great tortoise asleep on the surface. "And what is the tale of the turtles?" He asked. "Nothing; only food..."
29. "Words are the coins making up the currency of sentences, and there are always too many small coins." 30. "If now a friend denies not what was given him in trust,If he restores an ancient purse with all its coins and rust,This prodigy of honesty deserves to be enrolledIn Tuscan books, and with a sacrificial lamb extolled." 31. "Twelve thousand seven hundred and fifty-four dollars and three cents in coins, from six centuries." 32. "Just like old librarians, old coins are often more valuable than they appear at face value." 33. "But those coins are wishes! You're stealing other people's wishes! "The look Matteo gave her was so flinty, she could have chipped a tooth on it. "If you have money to waste on wishes, you don't need the wishes as badly as I need the money." 34. 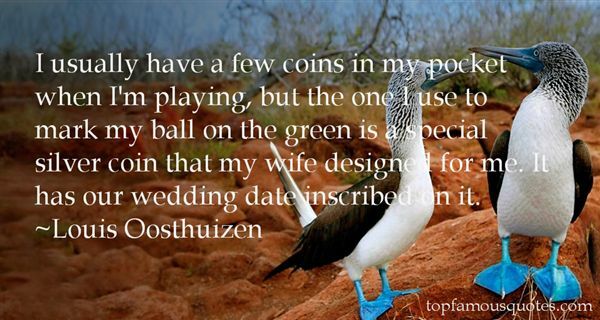 "I usually have a few coins in my pocket when I'm playing, but the one I use to mark my ball on the green is a special silver coin that my wife designed for me. It has our wedding date inscribed on it." 35. "Bitcoin is not an actual physical coin, and if computers are shut down, you can't buy or sell them. That's why nothing will ever replace gold and silver coins themselves, and all investors should have them at home or in a safe deposit box." 36. "Maybe we're standing like coins on the edge? "Allie considered this. "Meaning? ""Meaning, we might be able to shake things up a little, and find a way to come up heads. ""Or tails," suggested Allie. "What are you talking about?" said Lief. "Life and death." 37. "I collect Hot Wheels. I collect glass. I collect coins. And I collect cards." 38. "Anyone who said money didn't matter had never had to count the coins that fell between the cushions of the couch." 39. "If you hit a midget on the head with a stick, he turns into 40 gold coins." 40. "We're playing the Superbowl this year, we're opening up before the coins drop." 41. "Your taste in music is excellent. It exactly coinsides with my own!" 42. "Mira sat down on the rim of the fountain. The marble ledge was damp, and mist sprinkled her skin. Coins shimmered under the water like fish scales. She counted them, each one a wish, and wondered how love could be anything but good." 43. "If you mean the ease with which you drop coins when you're off a-cunting, you're right. You're a one-man charity ball for the whores of Camorr, you are"
44. "Have you heard of the most evil things done by people in their lifetime? They have coveted men's wives, killed hundreds of Christians and sold their best friend's life away for just a few coins. Isn't it interesting that they were God's chosen in the bible? ---Saul, Judas & King David"
45. "So one must be resigned to being a clock that measures the passage of time, now out of order, now repaired, and whose mechanism generates despair and love as soon as its maker sets it going? Are we to grow used to the idea that every man relives ancient torments, which are all the more profound because they grow comic with repetition? That human existence should repeat itself, well and good, but that it should repeat itself like a hackneyed tune, or a record a drunkard keeps playing as he feeds coins into the jukebox..."
46. "How do you get all those coins?" asked Mort.IN PAIRS." 47. "Words are instruments, they are tools that, in their different ways, are as effective as any sharp edge or violate chemical. They are, like coins, items of great value, but they represent a currency that, well spent, returns ever greater riches." 48. "It was here in Mayfair, that adjectives such as gracious elegant sophisticated and sublime trip off the tongue like coins into a parking meter." 49. "The author nicely encapsulates Paul's overarching intent in his letter to Corinth, to impress upon those in the church infatuated with the gifts of the Spirit a greater awestruck awareness of His presence in and among them. The author then illustrates thusly: if we have but a few coins, we may carry them lightly with little concern as to whether we lose them. But if we are aware that we carry a great sum, we will carry it with great care. How much more the Treasure of the Holy Spirit within the earthen vessel of our bodies?" 50. "He wanted to sink down and hug the coals to his chest. Flamboyant...coins of light...oil, wood, tatters...fumes from acids, soap, smoke...the sunlight shattered." Your knight in shining aroumor may just be an idiot in tin-foil."